The Nike KD 9 Home II is another home-inspired Nike KD 9 release that Kevin Durant will wear at the Oracle. Dressed in a simple White and Varsity Royal color scheme. This Nike KD 9 features a White Flyknit upper with Blue stitching and a matching fused mesh heel. Completing the look is a Blue visible Zoom unit and White rubber outsole. 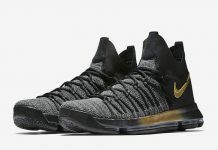 Look for the Nike KD 9 “Home II” to release on February 16th, 2017 at select Nike Basketball retail stores. The retail price tag is set at $150 USD.